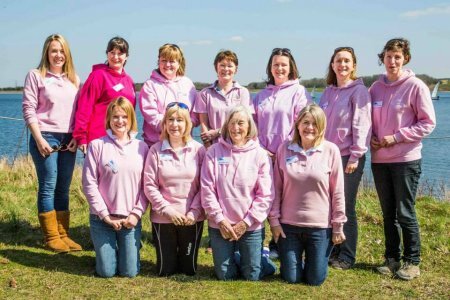 Pink Sailing was conceived and launched in 2012 as an opportunity for ladies who had either never set foot in a dinghy or else spent some time crewing for their other half but would really like to discover a bit more about their personal abilities. The aim of Pink Sailing is to get all our ladies together so that we can have some fun on the water without the intense competition of racing. This year we will be meeting on Saturday mornings. We have organised safety, rigging, launching and retrieving help from our male sailors. We plan to achieve something every Saturday, independent of the weather. For more information, contact Barbara Evans (Pink Commodore). Members of the Pink Sailing Fleet can also join their Facebook group here. Learning to rig boats of different classes. Learning to drive the tractor. Simple, very basic rules of the water. Learning to handle the safety boats and drive responsibly. Terminology of all parts of the dinghies, the rigging and the sails. Learn to use the club radios. Learning how to run a race, setting courses etc. Having fun is the most important rule of all. Members’ kids and grandkids are welcome but a responsible adult must stay with the child or children throughout the two-hour sessions. The aim is to get little ones on the water having fun using paddles and rudders - no sails. You will need to bring a complete change of clothing including shoes and socks. Life preservers are available but bring your own if you have them. No need to book, just turn up.